When a new conductor takes over an orchestra. the PR department invariably goes all out to convince the public that something momentous is about to happen and that they need to be a part of it. Occasionally, the new man (or woman) actually lives up to the hype. Last year in Dallas, Jaap van Zweden went far beyond even the most overheated hyperbole preceding his succession. On September 17, when the beat comes down on his second season with the Dallas Symphony, van Zweden’s music-making will speak for itself. Already known as ‘Jaap’ in Dallas, that familiarity has not dimmed maestro van Zweden’s palpable charisma. He doesn’t endear himself with good looks - although his appearance is definitely magnetic - but with intensity and authority. By the time of his appointment, he had already earned the respect of DSO musicians on the basis of his sixteen years as concertmaster of the Royal Concertgebouw Orchestra, one of the world’s great orchestras. After his first full season with the DSO, he has added, by all accounts, their admiration and gratitude for inspiring them to play better than they have in years. On the audience side, many Dallas listeners would say that their very fine orchestra, under van Zweden’s direction, was today playing with a fervor and excitement they hadn’t believed possible. 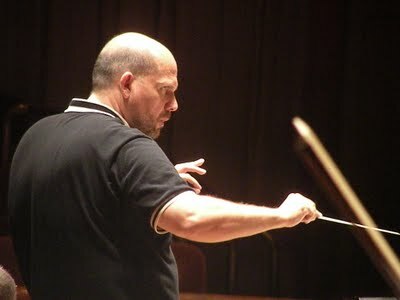 Jaap van Zweden still has a major musical base in Holland; he is principal conductor of the Netherlands Radio Philharmonic Orchestra (NRPO), and recently signed a new contract which will carry him through the 2014-2015 season. With the NRPO he will be committed to twelve weeks of concerts, as well as foreign tours and recordings. That still leaves plenty of time for Dallas and van Zweden will undoubtedly have a presence there for years to come. Maestro: It was a kind of master class for a young conductor – no doubt about it. But the strange thing is that for most of that time I did not think about conducting. I was concertmaster and busy doing the best job I could. But now when I am conducting and I can’t find a solution suddenly it comes from my musical memory, how Solti or Lenny (Leonard Bernstein) or Eugen Jochum did it. Sometimes I have to go and write it down so I have a concrete reference for the future. Paul Robinson: You mentioned Jochum. He didn’t conduct a great deal in North America, but record collectors will know him from his many fine Bruckner recordings with the Berlin Philharmonic, the Bavarian Radio Symphony and the Concertgebouw. Has he been an influence in your approach to Bruckner? Maestro: Yes, absolutely. Haitink also, but when he was alive Jochum was the great Bruckner specialist. What I learned from him was how to sustain sound, with a long stick and never-ending phrasing. Paul Robinson: But as great as Jochum was in Bruckner, he was sometimes criticized for his tempo changes, for slowing down or speeding up even when no such changes were marked in the score. Maestro: Yes, you are right. And that raises the questions of a conductor’s personality and putting his own stamp on the music. And while I was working with Jochum and Lenny – two conductors known for their individuality – I was also working with Harnoncourt. He was a frequent guest with the Concertgebouw Orchestra. And I made a decision that as a conductor I would be very free but always within the frame. And you know, the composers give you enough space within that frame to do your own interpretation. I try to be extremely respectful to the composer. Paul Robinson: But Bruckner doesn’t make it easy for the conductor. For some of the symphonies he has left us several versions. How do you decide which ones to use? Maestro: You know, for me this is not a big problem. For the most part, I was brought up with one or two versions and I think that the taste of Jochum and Haitink, they were not bad. I will stick to the versions they used. Paul Robinson : You are recording all the Bruckner symphonies with the Netherlands Radio Philharmonic. Audiences in North America seem to have much less interest in Bruckner’s symphonies than those in Europe. Do you plan to play Bruckner in Dallas? Will you try to develop a deeper appreciation of his music in Dallas? 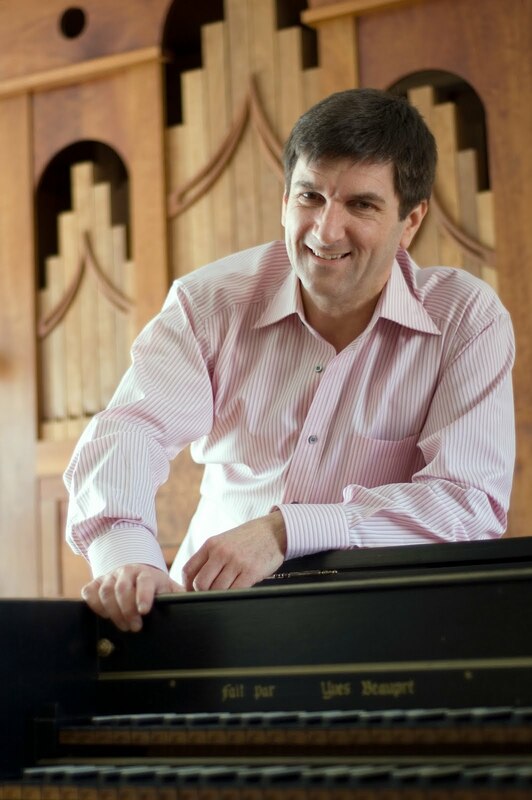 Maestro: When I first conducted in Chicago last year – the Bruckner Fifth Symphony – I didn’t notice any problem. Next season I am conducting Bruckner in Dallas – the Ninth Symphony (Nov. 5-8) – and I will also conduct Bruckner in Philadelphia. It is true that people respond more easily to Mahler. It is about emotions and people like that. When they go to the movies they like action. If it is a movie about beauty they will just go away. For me beauty is more important than emotion and action, and in my opinion that is what Bruckner is talking about and that is what Bach is talking about. If you listen to Bruckner and Bach it makes you clean inside. If you listen to Mahler you will be full of emotion and all kinds of thoughts. With Bruckner there is a line to God. With Mahler there is also a line to God but it has lots of sideways I would say. Paul Robinson: I am curious to know what you think of Mengelberg’s Mahler. Willem Mengelberg knew Mahler and often conducted his music and he was conductor of the Concergebouw Orchestra for many years. Yet his way with Mahler often differed sharply from that of other Mahler protégées such as Bruno Walter and Otto Klemperer. Maestro: I have some Mahler scores at my house, from the library of the Concertgebouw Orchestra, which contain all of Mengelberg’s markings. They are very interesting. But you know we live in a different time. Tempos are not set in stone. They have to be adjusted to circumstances. But at the same time I often think that we pay too much attention to external things rather than looking inside. When I think of the old maestros there was a lot of depth with these people. It is not so much whether the tempo is a little faster or a little slower; it’s the depth of the music-making. Our inner life, our soul is more important than the tempo. Paul Robinson: I was listening the other day to your new recording of the Shostakovich Symphony No. 5. I was curious as to how you would begin the last movement. Shostakovich indicates a fairly slow beginning then a very gradual acceleration to a very fast tempo. Yet while some Russian conductors obey the score others do not. Bernstein was a famous interpreter of the piece and he started with an incredibly fast tempo. Maestro: Who knows what is correct? I played this piece with Kondrashin and later I played it with Mariss Jansons. They are both from Russia and yet they are extremely different. I always get mixed up by different interpretations. I don’t know why people are doing what they are doing. From my study of the score it seems to me that one should get to the fast tempo very quickly. The music seems to work best this way, at least for me. Paul Robinson: What can be learned from the period instrument specialists? As you mentioned, Nikolaus Harnoncourt was a frequent guest conductor in Amsterdam when you were there. What did you learn from Harnoncourt? Maestro: I learned to phrase in a completely different way. And now I am talking about Schubert, Mozart and Haydn. For me, he was my great teacher in the music of these composers. And I think that is the future for our symphony orchestras. If you have an orchestra which can only play in one style it is very dangerous. It is a dead end. I would say that if you can play Mozart or Bach in a certain way and at the same time play contemporary music, you are much better off. These different styles of music have a way of feeding each other. You can’t play everything the same. You must be willing to embrace all the different styles of music. We play a lot of difficult contemporary music in Holland with the Netherlands Radio Philharmonic and I feel that makes my Brahms better. Or I should say, that makes our Brahms better. Paul Robinson: I have seen you quoted as saying that the Myerson is one of the top five concert halls in the world. That is high praise from someone who has spent so much of his musical life in the legendary Concergebouw. Is it really that good? Maestro: It is wonderful. In some ways it is even better than the Concertgebouw because the players can hear each other better. In the Concertgebouw sometimes we have to search for each other. Here it is a little bit drier on stage and that is good. Jaap van Zweden has a very wide repertoire and a keen interest in opera. He had hoped to begin an annual opera in concert series with the DSO last season – Puccini’s Madama Butterfly was set to go in May – but the severity of the recession forced the DSO to reduce expenses wherever possible and this project has been postponed along with a European tour. Nonetheless, the 2009-2010 season will include a number of major works with van Zweden at the helm. Among them are two Mahler symphonies (No. 1 Sept 24-26 and No. 2 May 20-22), the Bruckner 9th (Nov 5-7), the Rachmaninov Second Symphony (Feb. 14) and the Shostakovich Seventh (Feb.18-20). While the major record producers are drastically cutting back their releases, Jaap van Zweden is recording regularly in both Dallas and Amsterdam. The DSO has released a CD devoted to Beethoven symphonies 5 and 7 and just a few weeks ago followed up with an all-Tchaikovsky album containing performances of the Fifth Symphony and Capriccio Italien. The Beethoven is excellent. The Tchaikovsky is sensational! This is the freshest Tchaikovsky 5th I have heard in years. And the Capriccio Italien faithfully documents a tremendous performance I heard in the Myerson last season. These recordings are currently only available through the DSO website or the Symphony Store in the Myerson. They deserve wider circulation. Van Zweden has also been recording prolifically in Europe. A 2008 live performance of the Mahler 5th with the London Philharmonic is readily available (LPO-0033), and a 2006 reading of the Shostakovich 5th with the Royal Flemish Philharmonic is on Naïve AM 171. Most of van Zweden’s European recordings have been made with the Netherlands Radio Philharmonic and these are somewhat difficult to find. He has done complete cycles of the Beethoven and Brahms symphonies and is half-way through the Bruckner symphonies. Numbers 2, 4, 5, 7, and 9 are now available. These recordings are on the Exton label. Also for Exton, van Zweden has recorded six Haydn symphonies with the Netherlands Radio Chamber Philharmonic. While all the above European recordings offer impressive performances, van Zweden’s most outstanding releases so far have to be the opera performances on the Quattro label. The performance of Wagner’s Die Meistersinger, given in the Concertgebouw earlier this year with Bayreuth veteran Robert Holl as Hans Sachs, is deeply satisfying. Van Zweden gets to the soul of this music and from the Netherlands Radio Philharmonic he gets world-class playing. The choral work from the Groot Omroekoor is equally fine. Van Zweden is again a commanding presence leading Wagner’s Lohengrin, also from Quattro. The cast is headed by Klaus Florian Vogt in the title role with Anne Schwanewilms as Elsa. It’s hard to fathom the arrogance of a thirty-four year composer who writes a huge orchestral piece called Ein Heldenleben (A Hero’s Life) – about himself! What’s more, in the section called "The Hero’s Works of Peace" he quotes from his own previous compositions! Then you have the case of a thirty-four year old conductor who programs this virtuoso piece with a part-time orchestra. Fortunately, the supremely confident young composer was named Richard Strauss, and, as they say, the rest is history. As for the conductor, he happens to be a leader who can galvanize his players to perform way beyond themselves as they did this week at Place des Arts in Montréal. 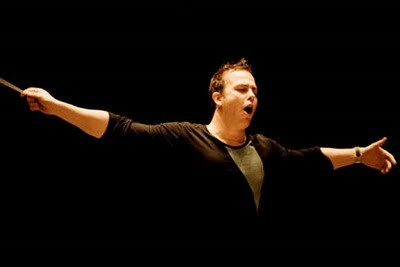 Yannick Nézet-Séguin celebrated his tenth anniversary as artistic director and conductor of the Orchestre Métropolitain this week and demonstrated yet again why he is not only a Canadian treasure, but also one of the most sought-after maestros on the international scene. It was an all-Richard Strauss programme with Don Juan leading off, followed by a set of orchestral songs featuring soprano Barbara Bonney and, after intermission, Ein Heldenleben. Don Juan was well-rehearsed and urgent in spite of some shaky trumpet playing and the love music was meltingly beautiful. I must confess that I am a huge admirer of Strauss’ vocal music, especially in the endlessly imaginative orchestrations by the composer himself. Earlier this summer we heard some of them in fine performances by Ben Heppner and Thomas Hampson at the Knowlton Festival. Strauss had a genius for capturing the very essence of the poetry he set to music. Bonney led off with one of my favourites, Die Heiligen Drei Könige aus Morgenland (Three Holy Kings from the Land of the West). The poem by Heine is a very simple telling of the role of the Wise Men in the Christmas story. Strauss makes it a thing of wonder and childlike innocence. In the five Strauss songs chosen by Bonney – actually six if you include the encore Morgen – the celebrated soprano was somewhat disappointing. Her voice didn’t have the lyric effortless quality we have associated with this singer in years past. In its place there was an engrossing maturity. Bonney seemed to be using her resources with an excess of caution; the voice never soared. Admittedly, Strauss puts a lot of orchestral weight in the way but Nézet-Séguin and his players accompanied with the utmost care. The lack of power and freedom seemed to be Bonney’s choice. Nevertheless, it is always a pleasure to welcome back beloved artists even when they are not at their best. One of Nézet-Séguin’s most impressive qualities is his fearlessness. He thinks nothing of recording all the Bruckner symphonies in Montreal or programming Mahler’s massive Eighth Symphony later this season (June 20). In taking on Ein Heldenleben, a work that has tested the finest ‘full-time’ orchestras, he was asking the Orchestre Métropolitain to do the near impossible. This Heldenleben opened with a very fast tempo- as befits the spirit of a thirty-four year hero - and in terms of technical mastery, it quickly became apparent that Nézet-Séguin had everything under control. At no time, however, did one sense that this performance was about mere accuracy. This young maestro’s technique is extraordinary – a combination of natural ability and hard work – but his performances are never just about getting the notes right; he always reaches beyond that to capture the full range of emotion and meaning in the music. His players gave him everything he asked for, and the results were spectacular! The augmented horn section was thrilling throughout, with authoritative and eloquent solos from principal horn Louis-Philippe Marsolais. The famous violin solos were played by concertmaster Yukari Cousineau. She may have been a little too careful with her long cadenza, but the warm tone she produced in the epilogue was something special. Her dialogue with Marsolais was as touching as one is ever likely to hear. Finally, I want to commend Nézet-Séguin for making the last chord of Ein Heldenleben – a trumpet-saturated E flat major - the thing of splendor it was meant to be. I haven’t heard it so well-prepared and sustained since Karajan. Most conductors are content to make a half-hearted crescendo, followed by an anti-climactic punctuation mark. This is neither what Strauss wrote, nor what he meant. This is a Straussian Valhalla moment, as the hero is seen one last time in all his glory. In purely musical terms, this chord must be of a weight and power to balance everything that has come before it in the piece. It is obvious that Nézet-Séguin took enormous care over this moment in rehearsal and inspired his players to give everything they had in the performance. Make no mistake about it. This was a very loud chord but – again, Karajan comes to mind – it had no hint of raucous blaring. This is one of the secrets of great conducting and Nézet-Séguin already knows many of them. The Orchestre Métropolitain simply has no right playing Ein Heldenleben as well as it did this week. This was a great triumph for both conductor and orchestra. At the risk of being boring or pedantic, I must mention that I changed my seat during the course of this concert and it made a huge difference. I heard Don Juan from the very back of the Parterre (under the first balcony) and I had the feeling I was standing outside the door of Place des Arts. The music had no presence. Then I moved up to the sixth row of the Parterre. 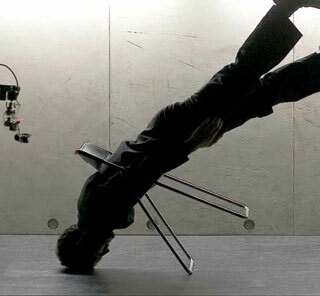 Now I could appreciate the intensity of the performances and hear all the details of balance and phrasing. I realize that not everyone is able to sit so close to the performers and sitting in close proximity can reveal weaknesses too, but I am making, I think, two valid points: that to really appreciate what musicians are doing in Place des Arts, it is necessary to sit as close to the front as possible, and that in a really good concert hall, one should be able to sit almost anywhere and get something close to the full effect of the music. That said, I and many symphony lovers with me, are ready to bid farewell to Place des Arts and more than ready to hear the OSM and the Orchestre Métropolitain in their new home – a smaller and better (hopefully!) new hall - currently under construction right next door. After a summer hiatus, This Week in Toronto is back for the new music season....and what a season it will be! The Toronto International Film Festival is in full swing, with both Roy Thomson Hall and Massey Hall occupied by TIFF events. So if you are a film buff, this is not to be missed! Ideally should have have your tickets already, but if you don't, you can still purchase single tickets and take your chances lining up to get it. The high profile music-themed movie, Io, Don Giovanni, has already happened last Saturday Sept. 12. There is a repeat showing this afternoon at the Ryerson Theatre. See Festival program for details. My choice for this week is Coco Chanel & Igor Stravinsky at Roy Thomson Hall on Thursday, Sept. 17, 9:30 pm. Another delectable - if non-musical - choice this week is The Young Victoria starring Emily Blunt, who was so deliciously nasty in The Devil wears Prada a few years ago (Roy Thomson Hall Saturday Sept. 19. Do go if you can. Because of the all-engrossing TIFF, the music season doesn't really gear up until after the film fest is over. 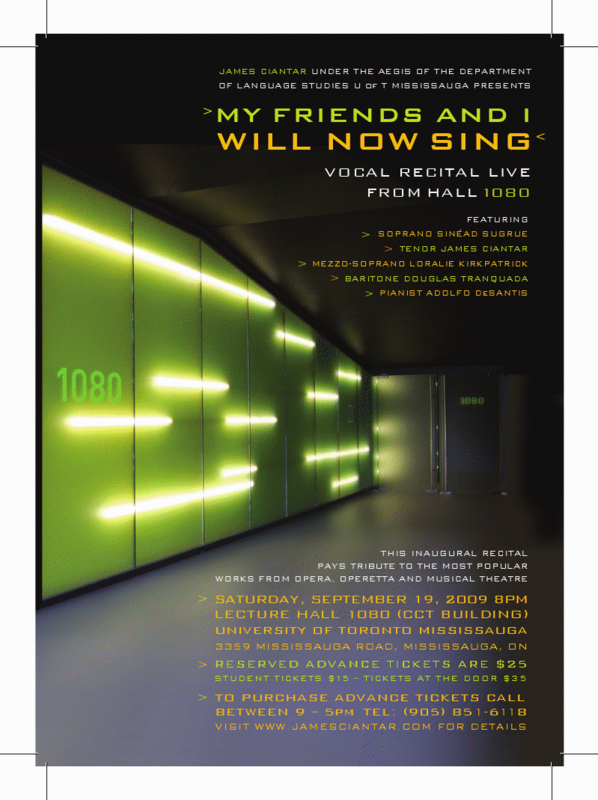 However an interesting event is My Friends and I Will Now Sing, a concert starring tenor James Ciantar and soprano Sinead Sugrue. Both are coaching with retired Canadian tenor Ermanno Mauro. Ciantar sang a promising Cavaradossi for Opera York last March, while Sugrue is a fine Lucia and Violetta, this latter role she will assume this season for Toronto Opera Repertoire. Also on the program are mezzo Loralie Kirkpatrick and baritone Douglas Tranquada, with pianist Adolfo De Santis. The concert is at University of Toronto Mississauga Campus on Saturday Sept. 19, 8 pm (CCT Building Lecture Hall 1080). For details see the poster above.